A couple of generations ago, many Westerners seemed to perceive acupuncture as a mysterious ritual from the Eastern cultures steeped in magic. 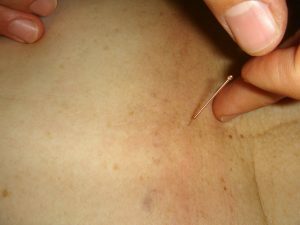 However, in recent decades, Western medical professionals have studied “alternative” therapeutic procedures like acupuncture and have found it to be a viable medical technique. In the performance of acupuncture therapy, the practitioner stimulates specific points in the “meridians” which run along the human body by lightly placing an ultrathin needle into the skin. Chinese practitioners began mapping these invisible lines where they believe the “qi” flows more than two millennia ago. In the Chinese holistic approach to medicine, healing practices are a philosophical discipline as much as scientific. When certain points – called acupoints – of the body are stimulated in this way, it renders a positive effect in a corresponding part of the body. Eastern medical theory has a more holistic approach to medicine as they attempt not only to heal the body but strengthen the qi, a person’s spiritual energy. In recent decades, Western doctors began studying Eastern theories more closely. Studies have shown what practitioners have known for a long time – acupuncture can have positive effects on the body which includes helping to ease discomfort, anxiety, stress, and in progressing the body’s natural healing abilities. Acupuncture needles are much smaller than standard hypodermic needles used by American doctors. People who have undergone acupuncture treatment claim that they feel at most a minimal prick, if anything at all. Like any other form of physical therapy, it should only be administered by a trained professional. When administered by a trained professional, stimulating a specific point will bring about a positive effect. For instance, placing needle at a very specific location near the hand of a client, causes the body to release endorphins, a natural pain relieving hormone we produce. Tapping a needle in a certain place in the upper arm will help relieve nausea. Acupuncture has been known to relieve discomfort in people suffering from sciata, arthritis, fibromyalgia, migraines, and many other maladies. Back pain: For back pain remedy, acupuncture can focus on a number of acupoints that can be used depending upon the specific area of the ailment. Back pain can have a number of causes such as strained and stretched muscles. When back pain bothers you, it’s a good idea to talk to your doctor to see if acupuncture therapy is a feasible remedy. Digestive discomfort: Acupuncture has been found effective in relieving digestive disorders and a host of other problems. When the appropriate “acupoints” are stimulated, certain muscles are relaxed, which produces the needed balance in blood flow; thus, the pain subsides. In the cases of chronic recurring pain, a series of treatments might be necessary. Ailments in the digestive tract might be the result of constipation, Crohn’s disease, irritable bowel syndrome, or many other causes. Some require complex medical treatments, but many are easily treatable with acupuncture therapy or another form of alternative healing. Infertility: Acupuncture is an effective technique used to counter infertility. A series of treatments can enhance male sperm count and motility as well as aiding a woman’s body during ovulation to improve chances for conception. Dysmenorrhea: Also called menstrual cramps, or period pains, dysmenorrhea is caused when a woman’s uterus periodically contracts, cutting off the flow of blood in the tissue. Acupuncture and other forms of alternative therapy relax the muscles in that region thus returning blood flow to normal. Headaches: Headaches are among the more common ailments brought on by stress, and one of the easiest to remedy through acupuncture therapy. Primary headaches are caused when over activity stresses sensitive areas of the brain; it’s easily treatable. Secondary headaches are often symptomatic of a more serious condition. A person with frequent headaches should consult a physician and ask if acupuncture is a feasible remedy. Neck pain: Acupuncture therapy targets particular acupoints (depending upon the cause of the discomfort) that will alleviate the pain and in some cases may be able to speed up the healing process. Neck ailments are probably a more common thing than people realize with many possible causes: a herniated disc, a pinched nerve, viral infection, and more. The possible treatments vary, according to the causes. For some ailments it is usually better to check with a physician to see if acupuncture is a viable treatment. For many people reaching out to medical treatment is cost-prohibitive. The People’s Organization of Community Acupuncture (POCA) is trying to change that. The movement is nationwide and can be found at several addresses online “community acupuncture” is Googled. The organization and the movement seek donations to help those who can’t afford the normal cost of treatment by their own means. Also, in the community acupuncture treatment, people are administered acupuncture in groups. This not only streamlines the procedure, but clients can interact with one another which builds up a sense of camaraderie. This shared experience tends to enhance the atmosphere of relaxation and healing. The staff at Sean’s Massage Center is trained in the ancient science of acupuncture therapy. This technique utilizes natural pressure points on the human body to alleviate discomfort, and it must be handled by a professional. Sean’s skills have provided rejuvenation services to men and women in the Columbus area for over 19 years. If you need someone that can help relieve stress or cure chronic headaches, call to schedule your appointment for a therapy session right away. He has two convenient locations to better serve the people in his region – Dublin/Upper Arlington and Pickerington. Sean received his Massage Therapy License on January 16, 1998. After attending the Central Ohio School of Massage in Columbus, he moved his training on to complete a 670-hour series of courses in anatomy, physiology, and hygiene. This gave him the skills he needed to properly ensure a relaxing and therapeutic massage for every client that walks into his center. Now, he is a proud member of The National Honor Society and The American Massage Therapy Association (AMTA). You can call the center at (614) 327-4338 to set up a session or go to the website and schedule it online. The cost is about $25/ session for this highly specialized technique. If you have any questions about this or other procedures, they will be answered. You will be contacted via email with details about the appointment. Sean's Massage Center reserves the right to charge a full cancellation fee for appointments not cancelled 24 hours in advance.